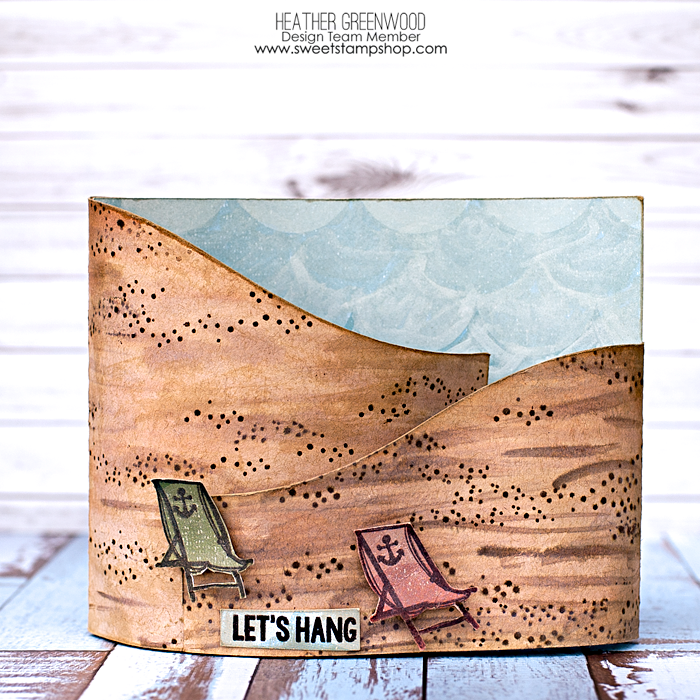 I'm excited to share with you two cards for today's new releases at Sweet Stamp Shop. 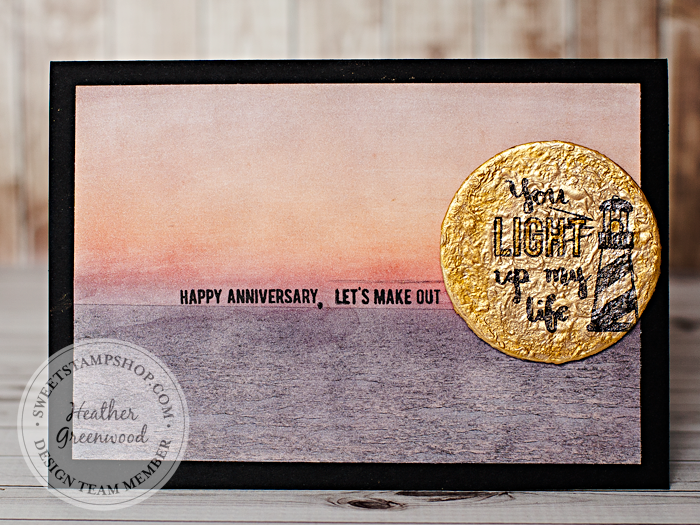 The themes for these stamp sets are so perfect for the end of summer and our days on the beach. I know I'm gonna be using them for my pocket scrapbook pages too. I had a ton of fun creating these cards! Be sure to check out the blog for more inspiration from the team! This first one, I was looking for something beachy for the Beach Bum set. I saw this bendy card cut file in the Silhouette Online store and knew instantly what I was gonna do. Isn't it such a fun shape for this set? I used distress inks and my water brush on kraft card stock for the front two pieces. For the background, I had this gorgeous scalloped paper from Studio Calico and was able to cut out just the blue part. I used a blueish white spray ink and my water brush to mimic the scallops and make them look more like waves. 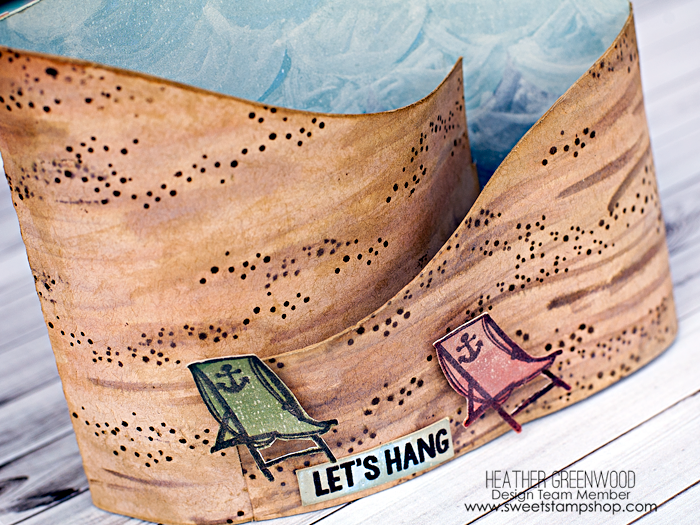 I then used some of the distess ink to stamp the sand and stamped the chairs on the other colors of the scalloped paper and cut them out. "Let's Hang" is from the Koala stamp set. I think that's one of my most fave sentiments. Too perfect for this beachy scene. Now to figure out who to send this fun card to. I created this card for my hubby for our Anniversary this month. We'll be celebrating 13 years in a couple weeks. The background of the card is the 4"x6" card from my Facebook freebie for 500 likes on my FB page. It's actually a photo I took of the sunset on vacation last month. I added lots of watercolor techniques to it and I loved how it turned out and couldn't wait to use it. For the "sun" I used a circle piece of chipboard and covered it in several layers of gesso and gold paint and spray inks. The texture is a lot of fun but I will admit it took several tries to get a clean image on it. The key was using the VersaFine pigment ink to really get into the grooves and lots of pressure. I used my Wink of Stella brushes to give the lighthouse a little sparkle and the gold brush to fill in the lightbulb and the work "light". I also used it to outline and blend in around the edge of the circle. I don't think I can get a photo to really give it justice to how pretty it is. Mark really giggled at the "let's make out" stamp sentiment. It's fun, isn't it? Be sure to check out all the other new releases from Sweet Stamp Shop! I totally have an idea of what I'm going to do with the Fishy set for a journal card... We have lots of crabby moments in our house, LOL! 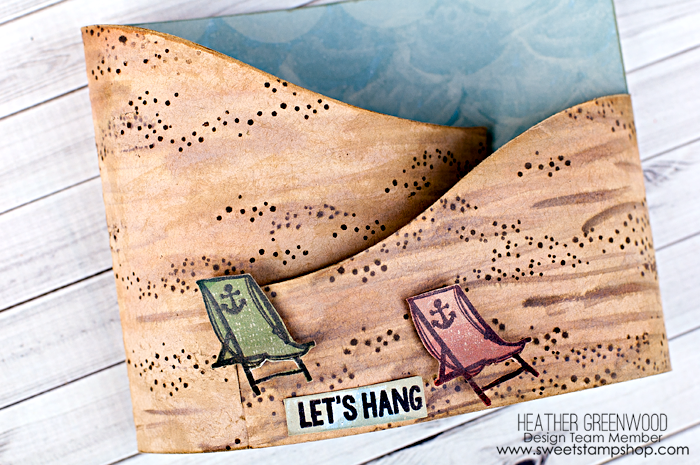 I also can't wait to play with maybe some home decor projects for the anchor in the Ahoy stamp set. We have lots of Coast Guard photos too, so I have some other fun ideas for that stamp set for those Coast Guard photos.